My first Ponderosa Lemon harvest! I’m very excited about my first Ponderosa Lemon harvest! The fruit has taken its sweet (or sour!) time to ripen, but they’re finally ready! So, I thought I’d share a bit about them. The Ponderosa Lemon is a very interesting specimen with very large, bumpy skinned, juicy, seedy fruit usually weighing 2-4 pounds. It is sometimes referred to as the 'Five Pound Lemon'. The flowers are intensely fragrant and produce loads of these huge lemons. The tree is self-fertile and always a real conversation piece. The flavor is typical lemon-like. They are grown primarily for their curious size and shape, but also make excellent juice and are great for cooking. The tree is small (to 10 feet) and fairly thorny while fruits can reach the size of a football! Caring for the Ponderosa is fairly easy. It requires good drainage, regular balanced feeding (reacts well to organic matter mixed into the soil on a regular basis), plenty of water (but allow to drain well), lots of sunshine and warm temperatures. I haven't had many issues with pests...I spray off aphids and promote natural pest control. The Ponderosa also requires little to no pruning...it's natural shape is very attractive and upright. I understand these trees do quite well indoors in northern areas, still producing tasty fruit and an interesting focal point. The Ponderosa began as a chance seedling in 1886. 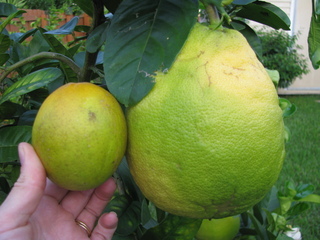 It was first propagated under the name "American Wonder Lemon" and is thought to be a natural cross between another type of citrus and a lemon, possibly Citron. The Ponderosa Lemon tree is frequently found throughout Florida, Texas and California. Lily, I love my ponderosa lemon tree. My lemons are starting to turn yellow, but my leaves aren&#x27;t as bright green as they were. Am I doing something wrong? Or am I not doing something I should be doing? Lily - How long does it take for your Ponderosa lemons to ripen? We moved to south Florida two years ago. I started growing a Ponderosa lemon in a pot last year. It has five huge lemons but they are not turning yellow after several months. Are they going to ripen or should I cut them off and wait for next year? Do I need to do something to help them turn faster? Thanks. Hey, Oak!!! So happy to have another Floridian on this site!! FYI...Daylilyjoy is also in Florida. Yes, the Ponderosa takes quite a while to ripen. Just hang in there. It still took another month + once mine started turning yellow. I still haven't harvested them all yet. They will pretty much fall off into your hand when they're ready. But they're worth it! What else do you have in your garden? Looking forward to seeing photos and hearing about them! Yes, these are in my garden. I have the Ponderosa, Meyer Lemon, Bananas, a Fig, Navel Orange, and a Mango. We&#x27;ll probably plant some Florida grapes next year after we build a nice arbor. As far as growing one in Seattle, you could definitely plant one in a container. In fact, many people do just for the unique display. The trees stay small, 8-10&#x27;, if growing in a container. Just make sure it gets plenty of light, water and food! Wow, those are huge! I grew up where citrus groves were a familiar sight, but I&#x27;ve never seen a lemon like that! Wow - that&#x27;s amazing! When I was in Capri, many, many years ago, the lemons there were the size of big oranges. I saw a tree with one lemon on it and the whole tree (all one or two branches of it!) was bent over nearly to the ground with the weight of the lemon! I will have to watch for the Ponderosa lemon around Austin - they look like they would be fun to try!